Pictured with 288 Flashback Arrestors, we are currently out of stock of 288s. VICTOR 315FC TORCH HANDLE W/CA2460 CUTTING ATTACHMENT. THIS IS AN ACETYLENE/OXYGEN WELDING KIT SETUP. ACETYLENE/OXYGEN WELDING/BRAZING (SWAN) ARE INCLUDED. THE TIPS AND OTHER ITEMS ARE EITHER VICTOR TYPE AFTER MARKET OR FOR GENERIC CONSUMPTION. Yes, this torch can accept Acetylene and other gases and can use other tips including acetylene cutting tips, heating tips, and the handle can handle 300 Series (Heavy Duty) Welding/Brazing Tips - all available in our store. We assembled this package for our Propane Cutting Specialists in the field. Note: Instructions Not Included; No booklet included. 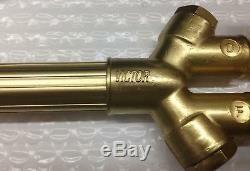 Qty (1) 1171-000 (300 Series) Acetylene/Oxygen Welding (Brazing/Swan) Tip. 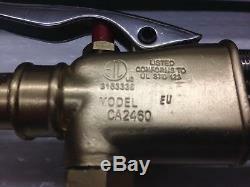 Qty (1) 1171-00 (300 Series) Acetylene/Oxygen. 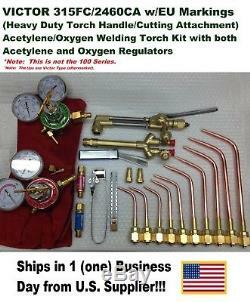 Qty (1) 1171-0 (300 Series) Acetylene/Oxygen. Qty (1) 1171-1 (300 Series) Acetylene/Oxygen. Qty (1) 1171-2 (300 Series) Acetylene/Oxygen. Qty (1) 1171-3 (300 Series) Acetylene/Oxygen. 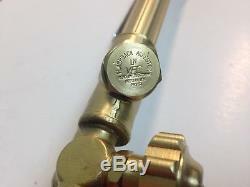 Qty (1) 1171-4 (300 Series) Acetylene/Oxygen. 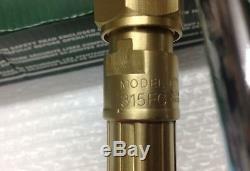 Qty (1) 1171-5 (300 Series) Acetylene/Oxygen. Qty (1) 1171-6 (300 Series) Acetylene/Oxygen. Qty (1) 1171-7 (300 Series) Acetylene/Oxygen. 1855 Thickness, Grade A White Soapstone. (Micro Metered Measurement-not guessing, or copying and pasting) Qty (1) Soapstone Holder- Approx. (Micro Metered Measurement-not guessing, or copying and pasting). Brass trigger depresses and slides to proper alignment hole and snaps back to lock in position. 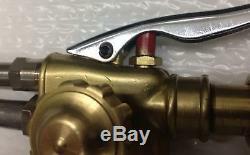 Non-corrosive channel with brass indexing trigger provides sliding action. Spring steel pocket clip oversized to fit leather aprons or thick denim. Qty (1) Pair Red Welder Gloves. Full cotton liner, Cow split, Reinforce in thumb, One piece of back, Size:15 w/ minor variations. Qty (1) Tip Cleaner Set-100mm size, includes Size numbers 6-26 Tip and Files, tapered ends, aluminum case. Qty (1) Triple Flint Striker for Welding. Qty (1) Set of 188 Flashback Arrestors (connects at the torch end) Pictured with 288 Flashback Arrestors, we are currently out of stock of 288s. 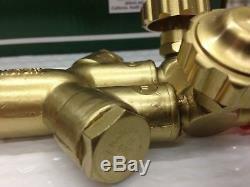 Qty (1) Set of additional Check Valves. 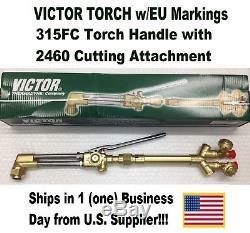 Victor 315FC torch handles for welding, brazing, cutting, and heating applications. These heavy duty 315FC torch handles feature durable brass and stainless steel construction and threaded assembly design for ease of maintenance and repair. Victor torch handles have provided the foundation for welding, cutting, brazing and heating applications for decades. Built-in reverse flow check valves no need for accessory check valves. Built-in flashback arrestors with no need for accessor flash arrestors. Works with all fuel gases. There are pressure restrictions for different gases. CA 2460, Heavy-Duty Cutting Attachment. Stainless steel tubes with Smooth cutting valve (push type). 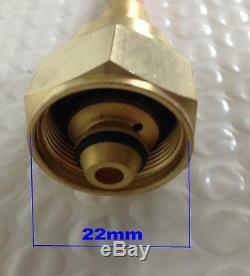 Brass coupling nut & double O ring tapered seal gives quick gas-tight seal without a tightening wrench. Weight 26.625oz (754.806gms). Gas Service: For use with all fuel gases with appropriate tip. Cutting Range: 8 (20.32 cm). Length: 9.75 (24.765cm) (not counting lever extension), Approx. Weight: 26.625 oz (754.806gms). Heavy duty cutting attachment-may use any fuel gas with proper cutting tip. Spiral mixer blends oxygen and fuel. Total Torch Length: Approximately 18.75 (47.625cm). Then as any experience welder should do, check your lines, torch, and all connections with soap and water for leaks before igniting. Note: Boxes may show aging and wear. Note: These are torches that have been stored and before EASB Branding. Additional Specs on the Regulators. Outlet Connection: 9/16 Iron lid. Max Inlet Pressure: 0-400PSI (0-2800 KPa). Max Outlet Pressure: 0-30PSI (0-200 KPa). All Brass with Iron lid. Victor Type HD (300 series) Oxygen/Acetylene. Brazing Welding Torch Tip Set - Sizes 000, 00, 0, 1, 2, 3, 4, 5, 6, and 7. You will receive Quantity 1 (one) of each of the following sized tips for a total package of 10 (ten) different tip sizes. Quantity 1 of each size -Sizes #000 thru #7. In this Set You will receive quantity one (1) of the following ten (10) sizes. Qty 1 - Model size: 000 Orifice: 0.4mm. Qty 1 - Model size: 00 Orifice: 0.5mm. Qty 1 - Model size: 0 Orifice: 0.6mm. Qty 1 - Model size: 1 Orifice: 0.8mm. Qty 1 - Model size: 2 Orifice: 1.0mm. Qty 1 - Model size: 3 Orifice: 1.2mm. Qty 1 - Model size: 4 Orifice: 1.5mm. Qty 1 - Model size: 5 Orifice: 2.0mm. Qty 1 - Model size: 6 Orifice: 2.6mm. Qty 1 - Model size: 7 Orifice: 3.2mm. Total Quantity: 10 pieces (tips). Premium quality Victor style welding/brazing tips 000-W, 00-W, 0-W, 1-W, 2-W, 3-W, 4-W, 5-W, 6-W, 7-W (elbow nozzle tips with mixer). Fits Victor and Victor Type med-size 300 series handles such as 315C/310FC/310C/350/310R and other aftermarkets versions. NOTE: Discoloration in new tips is normal. Not all tips will have that shiny look, but all are new and unused. This is especially true with the Gouging Tips we offer our valued customers. But just remember to blow them out with an air hose until dry. Additional Specs on Flashback Arrestors and Check Valves. I nlet Pressure(bar): 10. 288-L FUEL GAS (ISO 9001). Inlet Pressure(bar): 1.5. Oxygen-Acetylene (or propane) Flashback 288 Arrestor Set. 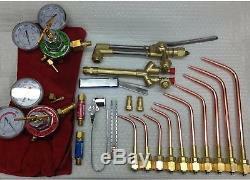 OXYGEN/ACETYLENE WELDING CHECK VALVE SET--FOR TORCH END use w/flashback arrestor. You should never connect a welding torch to acetylene and oxygen tanks without first installing a set of flashback arrestors and check valves. Not using these safety devices, could possibly cause a flashback within the hose, then ultimately flow back into the tanks, causing a major explosion. This is an extremely rare occurrence, but a set of check valves and flashback arrestors will prevent it a from occurring. Check valves on the torch are a first, then Flashback arrestors on the gauges are the best protection possible. Don't take chances with your life or the life of others... (Not including weekends and holidays). Cutting Tips-Propane (100 Series Torches). Flashback Arrestors and Check Valves. Even if the items are from different categories. These items are new in box (NIB) unless otherwise specified. You must be 18 or older to order this product. In some areas, state and local laws further restrict or prohibit the sale and possession of some of our products, including air soft, blowguns, knives, etc. States: California, District of Columbia. Cities: Bridgeport (CT), Chicago (IL), Atlantic City (NJ), New York (NY), Brooklyn (NY), Bronx (NY), Staten Island (NY), Queens (NY), Glen Oaks (NY), Floral Park (NY), Philadelphia (PA). This product, if air soft, knives, or blowgun, may be mistaken for a firearm (or weapon) by law enforcement officers or others, and altering its color or brandishing, or even possession, of the product in public may be considered a crime. It is unlawful to alter the coloration or markings to make the product look more realistic. If and air soft product, then it is considered an Air soft toy gun; it complies with all federal laws and regulations. We do not provide warranties with our products. Some items we are fully able to test; other inspections are done through visual comparisons. We do not provide warranties on any electrical item or goods involving electronic components. We are not responsible for misuse, abuse, or other actions of the shippers or buyers that damage products. (Can only view the date of dispatch). The item "VICTOR 315FC TORCH With2460 CUTTING ATTACHMENT & REGULATORS (WELDING KIT SETUP!
)" is in sale since Tuesday, April 24, 2018. This item is in the category "Business & Industrial\CNC, Metalworking & Manufacturing\Welding & Soldering Equipment\Welding\Welders, Cutters & Torches\Gas Welding Torches". The seller is "powersportsandoutdoors" and is located in Rayne, Louisiana. This item can be shipped to United States.